"He was hiding in a hole with 2 sweaty and handsome men" say sources. Saddam "Mall Santa" guise failed to deter US Special Forces. Saddam Hussein in a rare photograph with his many wives. Runners up included Tom Selleck (Magnum P.I. ), Dennis Franz (Sipowitz, NYPD Blue) and a hand full of highway patrol officers across the United States. 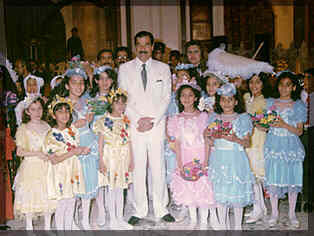 The Release of Saddamy Pops was made to show Saddam's devotion and love of children. In several interviews, Saddam Hussein has made congratulatory statements toward those responsible for the September 11th terrorist attacks on the United States. Not that he was in any way involved or aware it was going to happen, of course. "Jihad, yes, that's it!, yes, YES! mmm, oh, OH! JIHAD!" Rippling Muscles, Incredible Mullet and Look at that Dickbroom! Amazing!